You figured it would look the best, but what about the rest? My first impressions. 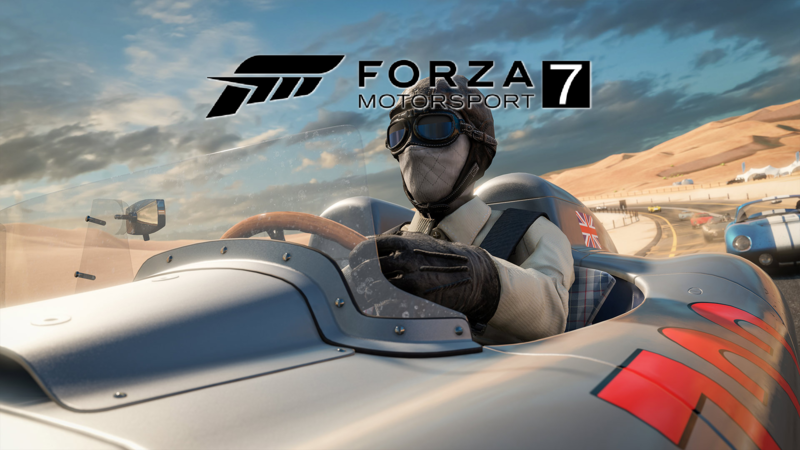 After returning from a month away from home (and therefore, gaming), I yearned to play no game more than Forza 7. I’ve had the Ultimate Edition preordered since it was announced at E3 (quite literally preordered on my phone from LA), and I couldn’t wait to get home from work to try out what has been touted as the best racing game of all time. Although I played it at E3 on “Xbox One X” hardware (quoted for a reason), I hadn’t seen it on current Xbox One hardware, so I lowered my expectations on the graphics and honestly thought I’d be a little disappointed. It’s a familiar predicament I’m seeing a lot on social media from gamers planning on upgrading to the One X: play “enhanced” new releases now on our current “inferior” hardware or wait for 4K full visual fidelity. When it comes to Forza 7, I’d advise gamers to ignore all of that – this game is quite possibly the most beautiful game on current gen. Environments in this year’s Motorsport are probably the most immersive and realistic I’ve ever seen. From the amazing weather effects (billowing fog, misty rain, etc), to the pooling puddles on the pavement, to the shadows caused by sunrises/sunsets, you’ll be impressed by how lifelike and truly photographic everything looks no matter what view you race in. I know what you may be thinking – we’ve been saying this about Motorsport games for years now. But to be honest, I’ve never been as captivated by the graphics as I am this year. Could it be possible that developing the game with the One X in mind has motivated Turn 10 Studios to push the visual limits further even on the current console? Perhaps I’ll have to Tweet at a few members of the team to see if I can get a definitive answer on that! Before moving on to gameplay, one last thought on graphics from my first 6+ hours of gameplay: the interaction of the lighting on the cars has reached a new level in my opinion. The sunlight shimmers perfectly on every vehicle I’ve seen, something especially noticeable when racing in overhead/follow view, and the bending of headlight beams around cars at night adds another layer to the impressive physics that have been a trademark of the series. Let us know either in the comments or on Twitter if you notice these things while racing or if I’m overstating how good this stuff looks! The skies, cars, lighting – all photo-realistic. The interaction with the vehicles really allows the lighting and weather to give Forza 7 a leg up on the competition. 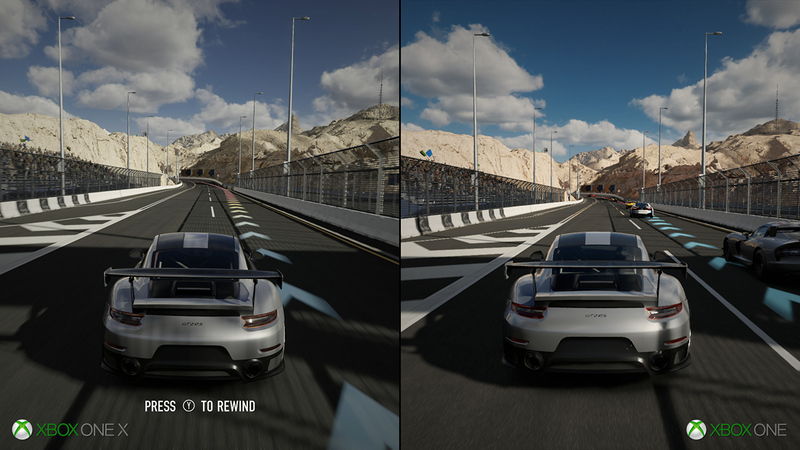 Graphics – truly breathtaking, even on current Xbox One hardware. Gameplay-wise, I’ve found so far that the Forza excellence you’ve come to expect makes it return with a few improvements. For example, I have probably raced 10 times in rainy or wet conditions, and the handling seems much more accurate. By this I mean that oversteer results in loss of traction much less than last year, and hitting puddles at slower speeds (especially with heavier vehicles like racing trucks) does not result in a hydroplaning complete loss of control. I’ll have to test this a bit more with a wider variety of vehicle classes, but so far with C-A class cars I’ve been very happy racing in the rain, and feel that my cautiousness is appropriately rewarded with more top-3 finishes. One thing I’m “raging” often about though is increased Drivatar difficulty in Forza 7. Even after dropping to “highly skilled” I found myself struggling to get on the podium until very recently. It’s true that I may have simply been too accustomed to Forza Horizon-style gameplay, but I figured that top-5000 leaderboard times should finish higher than 6th place, for example, against “highly skilled” Drivatars. In the last couple of gameplay hours I’ve learned to tune cars a bit more and have seen better results, so keep that in mind if you’re struggling in a similar way. There are just a few performance/presentation problems so far, and some may be fixed with a patch very soon after the standard edition releases. For one, the frame rate is certainly not a stable 60fps across all conditions/courses. I’ve noticed that especially in the rain with a lot of cars on screen the frame rate drops a bit, but certainly not to unplayable levels – more of a momentary annoyance. These hiccups are much more noticeable when racing in cockpit mode I’ve found, so if you don’t usually race in that view then you’ll probably not be bothered much at all. Another headache right now is online matchmaking – it is currently quite unreliable. I’ve successfully found and connected to a racing lobby by myself only a handful of times (eastern US region), and I’ve yet to connect with a lobby of friends. Like I said before, this problem should be gone at or soon after the standard release, but when you spend an extra $40 in order to access the game sooner you’d expect a major aspect like online racing to work at least most of the time. 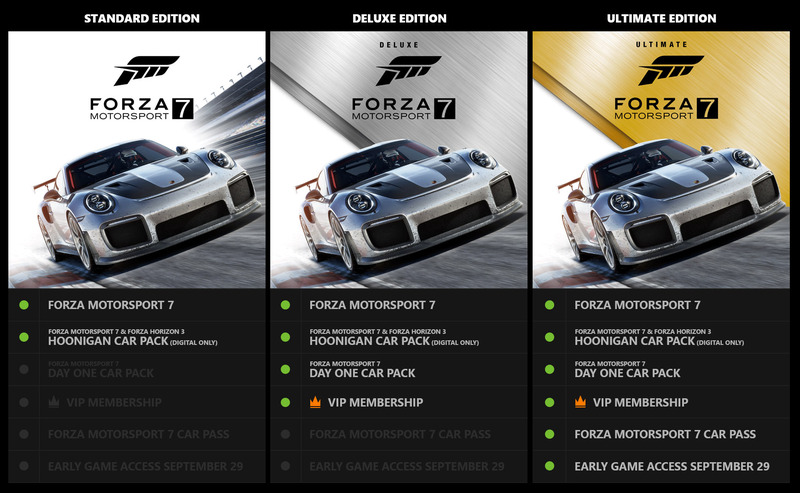 Here is what’s included in each of the retail versions of Forza Motorsport 7. From left to right: $59.99, $79.99, $99.99. I’ll end my initial impressions with a quick word about the new “microtransaction” structure: I actually like it, to be honest. Do I support pay-to-win in single-player experiences? Absolutely not. But the “unlock” structure featuring loot box collecting is refreshing and makes accruing cars/customization parts much more rewarding than in the past, especially when combined with the new garage leveling system. Turn10 could certainly have left out the pack-purchasing option, leaving it simply to progression unlocks, but games have been successfully using microtransactions in a similar way for years, and I’m starting to think that it’s (unfortunately) here to stay. Agree/disagree with my early thoughts? Let us know! We love to hear from you! Appreciate the love, man! Thanks for checking it out!